After thinking about it for a while now, I finally got around to making my own falafel. Not only does it have a slightly funny name (come on guys, it does! ), it also takes delicious, is easy to make and is surprisingly low in calories. 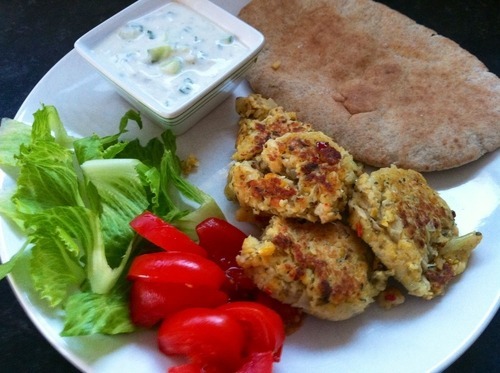 I’m a big fan of Middle Eastern food and with a sunny evening after work a falafel and salad pitta sounded perfect. I made my own tzatziki to go with it too! 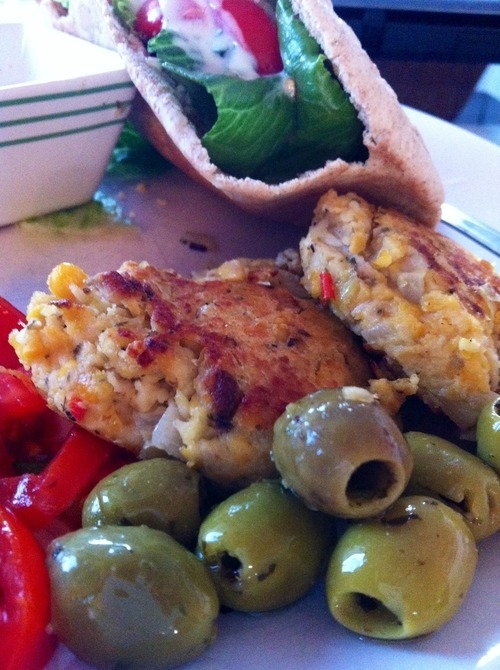 These are more a patty than a falafel ball. You can make 6-8 from this recipe. Fry the onion and garlic over a low heat for 5 mins until softened. Tip into a large mixing bowl with the chickpeas and spices, then mash together with a fork or potato masher until the chickpeas are completely broken up. I threw in a few breadcrumbs too and kept the mix in the fridge for half an hour for it all to mix together. Mould the mix into into patties (as big or small as you want). Then fry the falafels on a medium heat on each side, until golden brown and firm. I served mine a homemade tzatziki salad pitta and olives mmm! 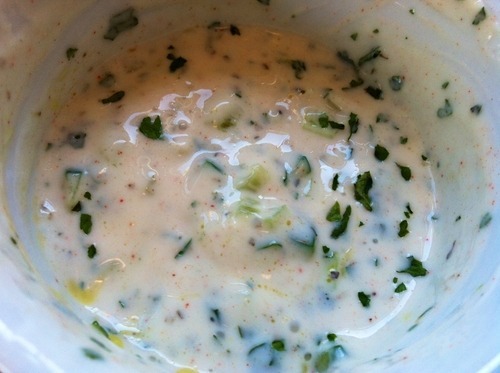 To make your own tzatziki you’ll need 350g Greek yoghurt, 1 cucumber, a sprinkle of paprika, two tbsp lemon juice, 2 small garlic cloves, parsley and a drizzle of oil. Mix it all together and you’ll get a beautiful result!